293 p. ; 22 cm. 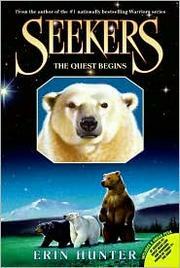 Three young bears of different species - one black, one polar, and one grizzly - travel on a perilous quest to the Nothern Lights, escorting a shape-shifting grizzly cub whose destiny will affect them all. Accelerated Reader MG 5.4 12 Test #123127 BGMS. Hunter, Erin. The Quest Begins ; bk. 1. 520 Summary $a Summary, etc. note Three young bears of different species - one black, one polar, and one grizzly - travel on a perilous quest to the Nothern Lights, escorting a shape-shifting grizzly cub whose destiny will affect them all. $c ld03 2002-09-06 to Child. Lit. for subj. $e lb16 2003-02-25 chg&apos;d call no. $a ps13 2003-12-18 1 copy rec&apos;d., to CIP ver.